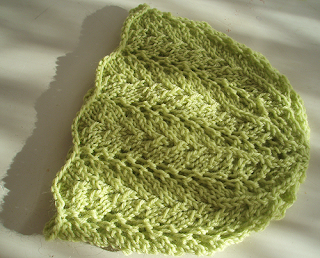 I'm slowly getting my knitting mojo back... this little Vine Lace baby bonnet from Knitting Daily was a start. I used the Heirloom Baby Yarn from my stash, and made it in one day. Don't know who it's for yet, but I'm sure it will find a home eventually! Another beanie, this time for Dotter's boyfriend's little brother, who turns 2 in about a week. It's the Little Cables beanie pattern - I took a guess at the number of stitches to use for a Toddler size (cast on 91, ie a 13 st pattern repeat x 7, and it seemed to work OK). 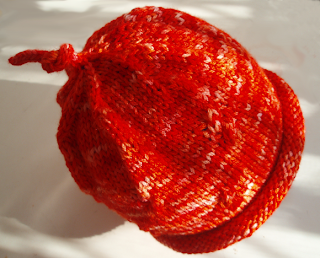 I did a rolled brim (ie just knit and knit and watch it roll up) rather than the ribbing. Dotter suggested the knotted i-cord top. I'll know by Saturday if it fits him! The colour is really hard to photograph well - it's basically a rich orange /red with lots of variation, as it's hand dyed Totem that used to be pink (courtesy of Taph). 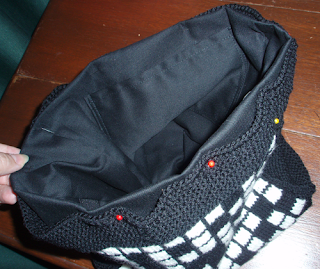 At last, some progress on the Crossword Bag - I've FINALLY sewn the lining, and am hand-stitching it in tonight. Then all it needs are handles. And for me to write up the pattern - without all my pattern notes (which were in the notebook I lost...). Still, it's pretty straight-forward, hopefully won't be a drama. Thank you all again for all your very kind emails, comments, wishes and everything during this difficult time. I've really appreciated hearing from so many friends from far and wide. My parents and siblings have been reading all your comments on the funeral post, and have been very touched as well. Tim's Memorial Service is this Sunday (to be held in Canberra, for those who didn't travel to the funeral - such as his doctors, friends, carers, and family friends), and then that will be the end of the public grieving process, at least. Still swinging pretty unpredictably between tears, relief, feeling good, feeling numb, and occasional bouts of guilt, as are the rest of my family. I'm remembering more stories about Tim, which is nice, too. News of our other ailing family member; Lily is still with us, although her condition is slowly worsening. My first thought every morning is whether she's still alive ... and she has been so far, despite scaring us at times! Her little doggy medications are helping still, although not as well as before. It's a miniature! Look! It's a rose, and it's tiny! I'm nearly feeling sane enough to cope with reading and commenting on all my lovely friends' blogs again ... hope to catch up with all your goings on before too much longer! 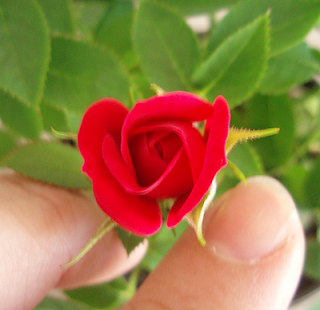 What a beautiful rose, and so very miniature. The baby's hat looks gorgeous, especially as it is green!! I think once the public grieving is over, you need some time to yourself, to think and remember. I like knitting for little ones. The projects are quick and generally easy. Every now and then, we all need to have and instant gratification project. I love the rose bush (I have a few in my garden). And yes, I know the dangers of living too close to a place like Bunnings....there's something for every one there. What a lovely little rose - just beware the dreaded brush-tailed possum! We had a little miniature rose quite like that one, but apricotty in colour, and every time the buds would get close to opening the damn possums would eat them. Those recipes for possum-repellent chilli-pepper sprays did no good, either. The wretched furry beasties considered it a condiment! Did you get a Jejune day? Heaven knows you are due one!I bet that's when you went rosebush shopping. What a sweet little beauty. The crossword bag is so elegant and witty. Good on you! Beautiful work. I continue to keep you and your family in my prayers. My thoughts are with you. Nothing like the cute quick knits to get you back in the knitting swing of things - both baby hats are very cute! Lovely little rose - very sweet. Lovely rose - and the hat knitting is a life-affirmation, don't you think - what a lovely post! Look at all the sweet tiny things in this post! Cute little baby hats, delicate little roses. Oh, the tiny things. I love them. Oh that lace hat is beautiful. I must make it! Great amendments to the little cables beanie. That's worked really well. And the bag! Hooray! It's looking so great. Those tiny, tiny roses are stunning. Love that crossword bag!!! And the beanies are gorgeous. Along with socks I would love to knit beanies - still haven't tried anything more adventurous than a plain scarf although I do have the wool for socks and for your beautiful lap rug - one of these days I'll be brave and have a go! Love the little rose as well - I'm sure it will make you happy whenever you look at it. Wishing you and your family strength and peace over the coming weeks - and lots of little things to make you smile. I just completed two preemie hats and will add the lace bonnet to the mix. Need to pratice lace. I could smell the roses here. smile Hug to Lily. The baby bonnet is beautiful! I love it. 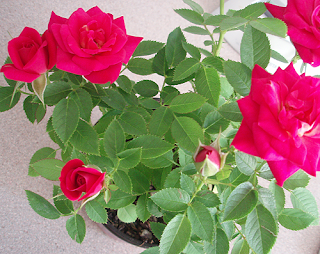 I wish we could find a rose bush like that here but I doubt it would be very happy. Sorry I've been so quiet, my free time and social life is really gone. :( No more knitting time. I love that crossword bag. It's so wonderful. I hope that the service was lovely.